I feel kind of vindicated. I wrote an article about the original KA-BAR TDI Law Enforcement Knife a while back that essentially said, “Like the knife, hate the sheath.” And I got hammered for it on a few forums. To be fair, my article was titled, “KA-BAR TDI Knife Review: Unsafe for Duty,” so I guess I started it. But that is in the past since the updated knives have a hard plastic sheath with a sliding thumb lock to keep the blade under your control. Well, KA-BAR has finally addressed what I thought was the shortcoming and officer safety issue. In the avalanche of booths at SHOT Show 2014, I apparently missed KA-BAR’s knives and my opportunity to check out the two new TDI rigs, which are collaborations with custom knifemaker Rick Hinderer and Tactical Defense Institute (TDI) President John Benner. Mr. Hinderer designed two different blade shapes for the TDI. The Hinderance model is a Wharncliffe, while the Hell Fire is a modified tanto with a wickedly recurved primary edge. They are appropriately combative in nature. Both knives have a blade length of 3.56″ and are 7.25″ in totality. The full tang material is 1095 Cro-Van carbon steel at 56-58 HRC. It has an unnamed black coating. Scales are Zytel. Either knife weighs 4.5 ounces. A jimped thumb ramp and index finger relief at the choil secure the knife into the hand. The original TDI was nearly a punch knife in the hand, but the blade to handle angle is less acute in the new Hinderer TDI’s. I think the Hinderers’ relaxed stance will still accomplish the job of adding leverage to power cuts–as in cutting an aggressive suspect off you and your sidearm. This was designed by Benner to be a law enforcement back-up knife, so it is there to save your life. If this sheath can withstand a full force pull and retain the TDI without defeating the lock, then I will be thrilled. The knife itself is Made in the USA. The sheath is constructed off-shore. MSRP for either model is $111.56. They are currently available for 37% less at some on-line retailers. 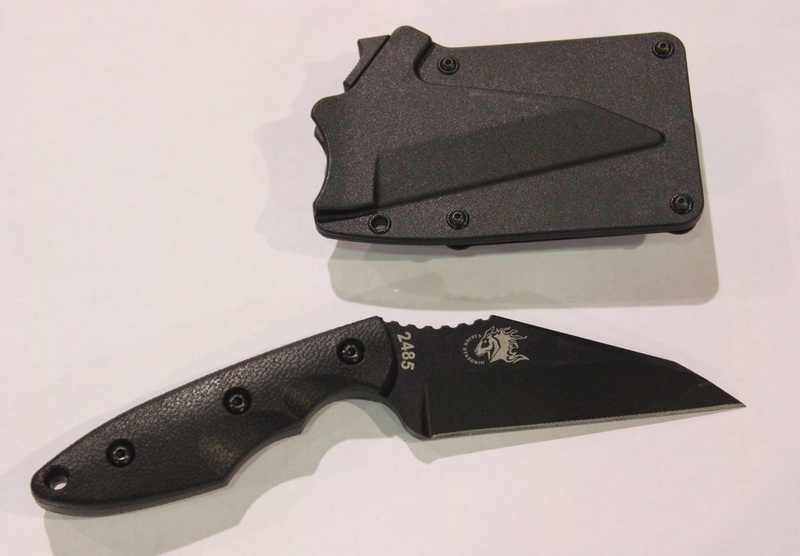 Update: I got to examine the new knives and sheaths at 2015 SHOT Show. Click here. This entry was posted in Knives, Officer Safety and tagged KA-BAR TDI knife, SHOT Show. Bookmark the permalink. Love the knife…hate the sheath. The Kabar Hinderer hellfire sheath was junk and rattled like a mariachi band. Kevin Robinson made my one of his level 2 retention holsters that is awesome. It wasn’t cheap but quality seldom is. Ken, how was the retention on the new sheath? It has a thumb release, but I’m curious as to its strength overall. “Love the knife, hate the sheath” seems to be the mantra for the TDI. So this is going to be somewhat of a long story. I was first introduced to the original Ka-Bar TDI knife like the one mentioned in the article that was titled as ” KA-BAR TDI Knife Review: Unsafe for Duty”. While this is a misleading title there are short comings with the original TDI knife it is not unsafe for duty use. So to start off with I have never carried the original TDI knife while on tour. The reason is very simple I do not like the fact that it had the dullest serrated edge I have ever seen. I contacted Ka-Bar and was told that they did not sharpen the serrated edge. So I was given a list of Cutlery shops in my area that could sharpen it. Not so easy they sharpened it and in a few days was dull as when I got it new. I am now working with Ka-Bar to fix the problem. To address the issue of easy access by the holder and the bad guy. I also noticed that and was somewhat worried about the retention. I do not think that I would carry the knife as Ka-Bar and other articles I have seen show it. I would find a way to mount it to my ballistics vest. I saw the new Ka-Bar TDI Hinderer Hellfire and had to have one. I saw great potential in this knife and was very pleased to see that it was designed by Hinderer Knives. I don’t carry the TDI Hellfire behind my spare magazines like Ka-Bar shows. There are two reasons that I don’t. First off the TDI Hellfire is much longer then the original TDI and sticks out more than the original TDI knife. The second is that the retention system on the TDI Hellfire is hard to get to with both hands. I mounted the knife on the inside of my right duty boot, with the knife on the inside against the leg and the clip on the outside. Works great for a boot knife and can be accessed with both hands. The reason that I like the TDI Hellfire knife over the original TDI knife is that you can hold it in a slashing grip or a fighting grip (Blade against forearm). The original TDI did not feel right when held in the fighting grip. The draw from the holster that Ka-Bar sends with the knife gives you a perfect grip with every draw whether it is the slashing grip or the fighting grip. With the original TDI knife on the draw my index finger on each hand had the finger over the cutting edge and could not find a way to draw it with out this happening. The TDI Hellfire knife if great it has just the right angle in the handle and blade. The finger groove on the TDI Hellfire is just deep enough to prevent the hand from sliding down the blade if used in a stabbing motion. I noticed someone was asking about the retention system on the TDI Hellfire. Let me say this I can take the knife in my strong hand and hold the holster with my support hand and pull as hard as I can to remove the knife and it will not come out. To me it looks as the knife is locked in place by locking against the thumb groves. So with this the harder you pull the tighter the lock holds the knife. Now with all retention systems they can be defeated and there is no system better than situational awareness. The edge of the TDI Hellfire is like the original TDI needed some touching up but did not take anytime to get it sharp enough to shave with and so far has held the edge just fine. I would recommend this knife for anyone looking for a backup duty knife for weapons retention or for when it all goes wrong and it is your last ditch effort. Very nice review, Hansen. I was especially interested about the retention of the new sheath, but you explained it quite well. I appreciate your taking the time to write that up for us. Here’s the deal. The original metal belt clip everyone hated on the original TDI knife is what comes standard on the Kabar Hinderer versions. The retention is quite good. The rattling in the sheath is not. A fellow co-worker who has the original sheath has already has screws fall out of it. Kevin Robinson builds bombproof sheaths. My knife does not rattle and a 6-10 330 Sasquatch of a co-worker tried to remove it forcibly it didn’t budge. I spec’d the custom sheath (yes you have to send in the knife)with a 30 cant reverse off hand draw, with a teklock belt attachment. Having nearly used the old version while being assaulted in a ground fight I realized the need for secondary retention. Comments appreciated, Ken! We also have a Sasquatch. Funny how they gravitate to police work. Seriously, I’m glad you came through the critical incident intact. Thanks for your service. You guys can fix the rattling with a hairdryer.